Since the wind blows pretty much all of the time here in Monticello, I only see an upside to wind power. I enjoy looking at the wind towers. I can see them every day out of my office window. I met Christine Mikell a few years ago when her company began meeting with community leaders and landowners to talk about what it would take to build a big wind farm here on the edge of Monticello, Utah. "Christine is a good listener. In our meetings, she made it clear that the company wanted to be a good neighbor and collaborator." For example, I asked that the wind turbines be set one kilometer back from the Four Corners School property line, and she said she would find a way to make it work, and she was as good as her word. The Four Corners School of Outdoor Education is a private, non-profit organization dedicated to teaching everyone everything there is to know about the land, geology and natural and human history of the Colorado Plateau through a variety of education, service conservation and adventure programs. The School sits on 48-acres just off U.S. Highway 91. A couple of million people drive by the entrance every year. Some have only seen this country in the movies or traveling through Monticello on their way to a river trip or hiking adventure. These days, they see 27 wind turbines on the land behind the Four Corners School. Some visitors come in thinking we're the visitor's center for the wind farm! They always have tons of questions about how the turbines work, so we've made the wind farm a great teaching tool for our science center. We have one hands-on learning station exhibit that's a great show-and-tell and explains how you can put the wind to work generating electricity. The Latigo Wind Farm is a benefit to everyone in this community. in the construction phase, most of the sub-contracting went to local businesses. And the county and especially the local schools will benefit every year from the tax revenues the wind farm generates. 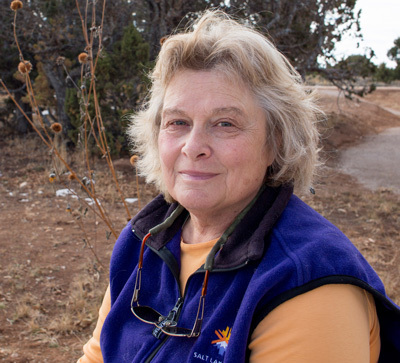 It's because of Christine Mikell that the Four Corners School has a good relationship with sPower, the company that acquired the wind farm after her company planned, permitted and developed it. And she set the foundation for good relationships with local landowners, elected officials and the whole community.